The siphon system offers the most environmentally friendly solution. 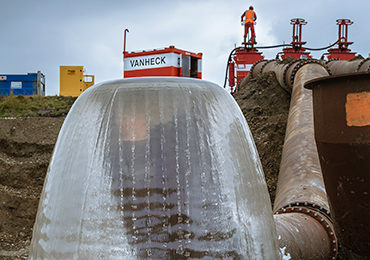 Van Heck saw its potential very early on and has now acquired wide-ranging expertise and experience in its use. This system is a great example of a sustainable and energy saving solution. 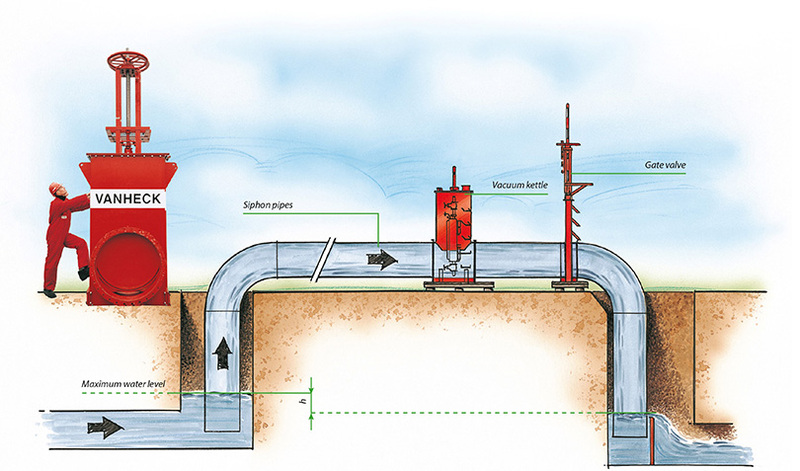 A siphon system works using the difference in height between the inflow and outflow side of the pipe. The air is sucked out of the pipes through a vacuum system comprising three electric vacuum pumps and a vacuum kettle. The flow of water on the inflow side of the siphon system causes upward pressure, creating a self-regulating effect. A difference in water levels of just a few centimetres is enough for siphoning. Flow rates can reach up to 25,000 m3 per hour per pipe. A siphon system is highly sustainable due to the limited operational costs and low sound level, and it can run on just one litre of fuel per day. The system can also be customised with an alarm, automatic valves and flow registration and limitation.